This Non-Smoking, beachfront home sparkles with granite countertops, ceramic tile floors, and ceiling fans in all the rooms. Enjoy ocean views from the deck, dining room, living area, and kitchen; and mountain views from the bedrooms. The upstairs half of a duplex accommodates four to 6 people, this home has a master bedroom with a Queen bed and private bathroom, a second bedroom with a King, a third with two Twins, and an additional full bathroom. Right out front is a sandy beach, perfect for swimming, body surfing, boogie boarding, and sandcastle building. Set well off the highway, the home is conveniently located across from Hawaii's most popular attraction, the Polynesian Cultural Center. Also nearby, are the Brigham Young University Hawaii, a grocery store, a movie theater, along with the restaurants and golf courses of the Turtle Bay Resort. This home also has a security system, an enclosed garage, ample extra parking, and laundry facilities, which are shared with the downstairs unit. Need more room? Book the downstairs Studio unit to accommodate an additional four people at $135 per night. We enjoyed our stay here at Laie Palms very much. The house was clean & the beach was beautiful sand with very few rocks. We didn’t need water shoes to swim here. The property is right on the water, no roads to cross or other homes to walk past. It is very close to groceries and to the Polynesian Cultural Center. We hope to stay here again. We heard some road noise (ambulance sirens) and lots of rooster crowing, but it seems that happens everywhere on O’ahu. We thoroughly enjoyed our stay here. Close to the Polynesian Cultural Center. The house an amazing ocean view. We were able to walk on the beach every morning which was so peaceful. We liked being out of the congestion of the other side of the island.The house was comfortable and relaxing. The beds were comfortable. Would stay there again in a heartbeat. 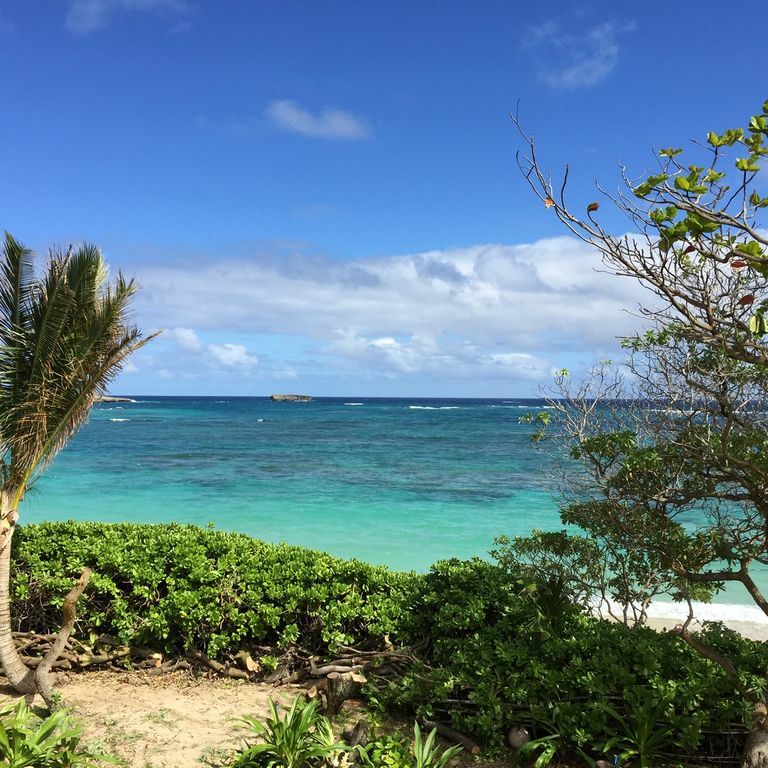 We really enjoyed our stay at Laie Palms. The house has everything you need and the view off the deck is breathtaking. We walked to the Polynesian Cultural Center and enjoyed laying on the beach. We will definitely stay here again. The beach was very rough and littered with quite a bit of drift wood and plastic that seemed to wash up directly in front of the house. But other than that, it was wonderful. The PCC is just down the street. You could walk to McDonald's for breakfast if you wanted to. It's a GREAT place. It’s the perfect beach spot! The home sits right on the beach, which is fabulous. You get to enjoy the sunrise everyday. I am so glad we rented the studio as well, it would’ve been awkward having another family in there. Laie is a cute town, but RIGHT in front of this house is a very sketchy home that you are never quite sure is occupied or not. There needs to be instructions on how to operate the cable TV, channel options etc. The porch is great, but when you’re here for a week the furniture is subpar. The pans in the kitchen need upgraded. The ones that are here are really bad. With that being said, the overall stay was great and being right on the beach is perfect!